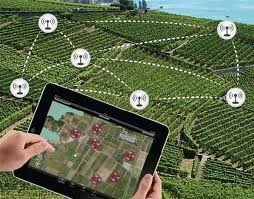 Wireless Sensor Networks (WSN) are the enabling technology for efficient and inexpensive Precision Agriculture (PA). Prior to PA, farmers had to rely on satellite and aircraft imagery or other map based systems to accurately target their growing areas. Precision Agriculture has the benefit of providing real time feed-back on a number of different crop and site variables. As its name implies, Precision Agriculture is precise in both the size of the crop area it monitors as well as in the delivery amounts of water, fertilizer, etc. This technology can isolate a single plant for monitoring and nurturing, or more typically an area in the tens or hundreds of square feet. The data collection, monitoring and materials application to the crops allows for higher yields and lower cost, with less impact to the environment. Each area receives only what is required for its particular space, and at the appropriate time and duration. A wireless sensor network for Agriculture is similar to those used in other industries such as Industrial Controls, Building Automation and Security Systems. The WSN system requires a centralized control unit with user interface, communication gateways and routers, power elements and most important – the sensors. Unlike other systems, Precision Agriculture requires a unique software model for each geographical area, the intrinsic soil type and the particular crop or plants. For example, each location will receive its own optimum amount of water, fertilizer and pesticide. It’s generally recommended that data collection be done on an hourly basis. Any more frequently doesn’t provide additional useful information for the software model and becomes a burden to the Wireless Sensor Network in terms of power consumption and data transmission. Less frequent monitoring may be acceptable for certain slow growth crops and areas that have very stable, uniform climate conditions. While Agriculture is typically thought of to be land-based, the concepts presented here are also applicable to water and under-water eco-systems. For example, a WSN is used to monitor kelp beds and algae growths. Air temperature for farms is often as critical as water temperature for marine plants. A similar correlation can be made for the amount of sunlight and pH levels. The modeling software incorporates the data from the sensors in a feedback loop which activates the Control Network. This provides the optimal amounts of agricultural inputs to the individual locations and varying times. As the cost for sensors and communications infrastructure trend downward, more growers are implementing Wireless Sensor Networks for their crops. This is becoming more prevalent with smaller farms, micro-farms and urban farms. In each of these situations, the crop yields are critical as growers may only have a very small area and unique space requirements to contend with. In some cases, farm areas are being constructed on vertical trellises which are only 4 to 8 feet high, and placed on high-rise roof-tops, or alongside residential housing. WSN technology makes it possible to monitor and specifically target each crop, making it practical and cost effect to implement Precision Agriculture regardless of the growing area. This approach is also easily scalable by adding additional communication hubs and sensors. For more information on this topic, may be suggest some books from Amazon?